Hopefully finals are over or coming to an end for you college kids, and winter break is coming soon for you high school kids! I, personally, never feel in the holiday spirit when class is in session, so we decided to go on a holiday spectacular tour of Philadelphia for this month’s SEPTAdventure! We started our adventure at Jefferson station and traveled to the Macy’s Christmas Light Show, the Christmas tree, Christmas Village, and the Comcast Holiday Spectacular. If you aren’t from Philadelphia (or even if you are! ), there is a bunch of holiday stuff sprinkled through Philly to check out. All of it is accessible by SEPTA, and a lot of things are located in Center City if you are willing to bundle up for a very brisk walk! If you are using SEPTA multiple times in a day, I recommend buying an Independence Pass. You can use it on any mode of transportation as many times as you’d like for the entire day. It’s an awesome deal, and makes touring Philadelphia with your friends so much easier and affordable! The SEPTA YAC wrapped ourselves in scarves, zipped our coats, put on our hats, and began our Philly holiday tour extravaganza on a cold, Saturday afternoon. 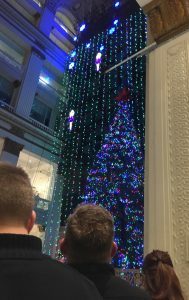 We first visited the Macy’s Christmas Light Show, which is a great escape from the cold and always a fun time. Next, we took the 17 bus to Rittenhouse Square to check out the Christmas tree. From there, we took the 17 Bus again for a lunch break at the new Wawa on 20th and Market. Our next stop was Christmas Village, so we hopped on the trolley and made a short walk to the JFK plaza. If you haven’t been to Christmas Village, I highly recommend! It is a fun place to stroll through. From there, we walked two blocks to the Comcast Center for the Christmas Light Spectacular. None of us had been for the Comcast light show before, but that is definitely a display we will visit again next year! 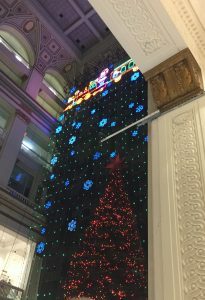 We ended our trip by taking a train from Suburban Station to Jefferson and walking to Reading Terminal Market to see their holiday train display. Philadelphia is full of holiday events, so kick off winter break with a day of holiday cheer and lots of SEPTA!